The Tender Bites Favorite Selections 12 pack includes 3 pouches of each: Chicken Dinner in Gravy, Ocean Whitefish & Tuna in Sauce, Turkey & Giblets in Gravy and Beef in Gravy. The 24 pack includes 6 pouches of each. 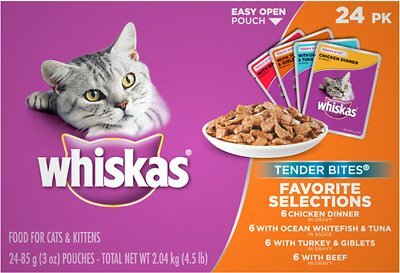 Variety pack of different flavors of Whiskas Tender Bites cat food pouches so your kitty can have a yummy variety to pick from at dinner time! Chicken Dinner in Gravy: Sufficient Water For Processing, Chicken, Meat By-Products, Wheat Gluten, Starch, Fish Oil (Preserved With Mixed Tocopherols), Glycine, Salt, Sodium Tripolyphosphate, Guar Gum, Added Color, Minerals (Potassium Chloride, Zinc Sulfate, Iron Sulfate, Copper Sulfate, Manganese Sulfate, Magnesium Sulfate, Potassium Iodide), Taurine, Vitamins (Choline Chloride, Vitamin E Supplement, Thiamine Mononitrate, Pyridoxine Hydrochloride (Vitamin B6), Calcium Pantothenate, Folic Acid, Vitamin D3 Supplement, Menadione Sodium Bisulfite Complex (Source Of Vitamin K Activity), Dl-Methionine. Ocean Whitefish & Tuna in Sauce: Sufficient Water For Processing, Chicken, Meat By-Products, Wheat Gluten, Ocean Whitefish, Tuna, Corn Starch, Glycine, Salt, Added Colors, Sodium Tripolyphosphate, Guar Gum, Minerals (Potassium Chloride, Zinc Sulfate, Ferrous Sulfate, Copper Sulfate, Manganese Sulfate, Magnesium Sulfate, Potassium Iodide), Taurine, Vitamins (Choline Chloride, Vitamin E Supplement, Thiamine Mononitrate, Pyridoxine Hydrochloride (Vitamin B6), Calcium Pantothenate, Folic Acid, Vitamin D3 Supplement, Menadione Sodium Bisulfite Complex (Source Of Vitamin K Activity), Dl-Methionine. 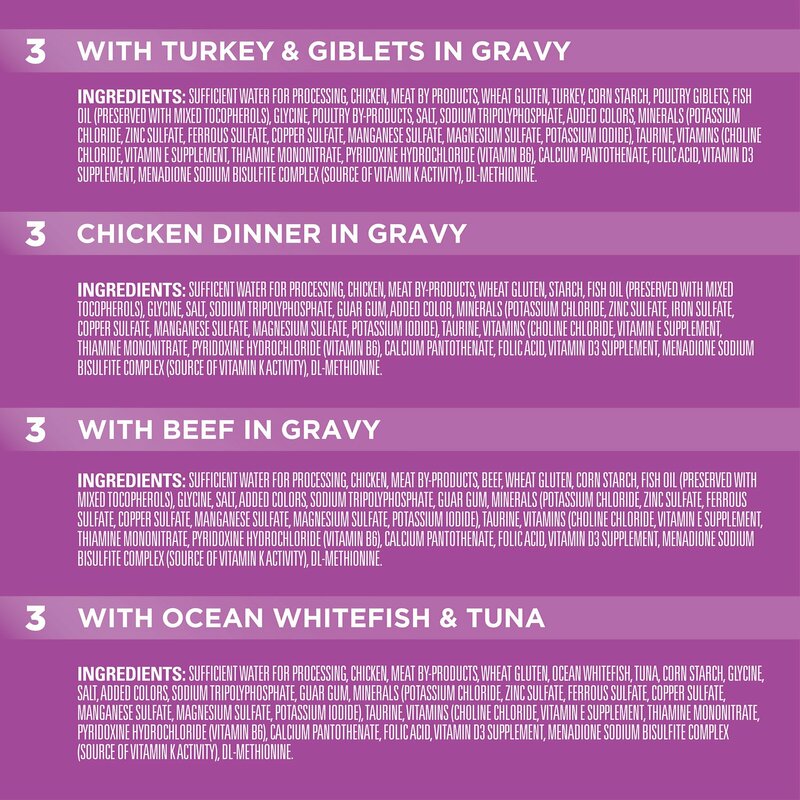 Turkey & Giblets in Gravy: Sufficient Water For Processing, Chicken, Meat By Products, Wheat Gluten, Turkey, Corn Starch, Poultry Giblets, Fish Oil (Preserved With Mixed Tocopherols), Glycine, Poultry By-Products, Salt, Sodium Tripolyphosphate, Added Colors, Minerals (Potassium Chloride, Zinc Sulfate, Ferrous Sulfate, Copper Sulfate, Manganese Sulfate, Magnesium Sulfate, Potassium Iodide), Taurine, Vitamins (Choline Chloride, Vitamin E Supplement, Thiamine Mononitrate, Pyridoxine Hydrochloride (Vitamin B6), Calcium Pantothenate, Folic Acid, Vitamin D3 Supplement, Menadione Sodium Bisulfite Complex (Source Of Vitamin K Activity), Dl-Methionine. Beef in Gravy: Sufficient Water For Processing, Chicken, Meat By-Products, Beef, Wheat Gluten, Corn Starch, Fish Oil (Preserved With Mixed Tocopherols), Glycine, Salt, Added Colors, Sodium Tripolyphosphate, Guar Gum, Minerals (Potassium Chloride, Zinc Sulfate, Ferrous Sulfate, Copper Sulfate, Manganese Sulfate, Magnesium Sulfate, Potassium Iodide), Taurine, Vitamins (Choline Chloride, Vitamin E Supplement, Thiamine Mononitrate, Pyridoxine Hydrochloride (Vitamin B6), Calcium Pantothenate, Folic Acid, Vitamin D3 Supplement, Menadione Sodium Bisulfite Complex (Source Of Vitamin K Activity), Dl-Methionine. Feed adult cats 1 pouch per 5 lbs of body weight, twice daily. Feed a kitten up to 2-1/2 pouches per feeding, 3 times a day. Cuts of diced meat that you can see are simmered in a scrumptious gravy for Whiskas Tender Bites. The easy-to-open, flavor-lock pouches ensure that the aroma and taste stay fresh. They come in delicious variety packs like Chef's Favorite, Seafood Selections and Poultry Selections to guarantee your cat will find a flavor she loves. 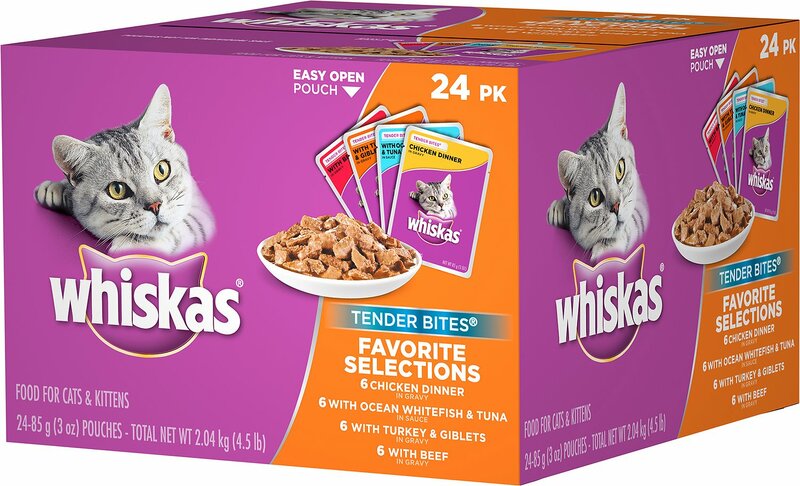 Whiskas Tender Bites is packed with flavorful ingredients, plus vitamins and nutrients for a balanced diet and to maintain overall health. 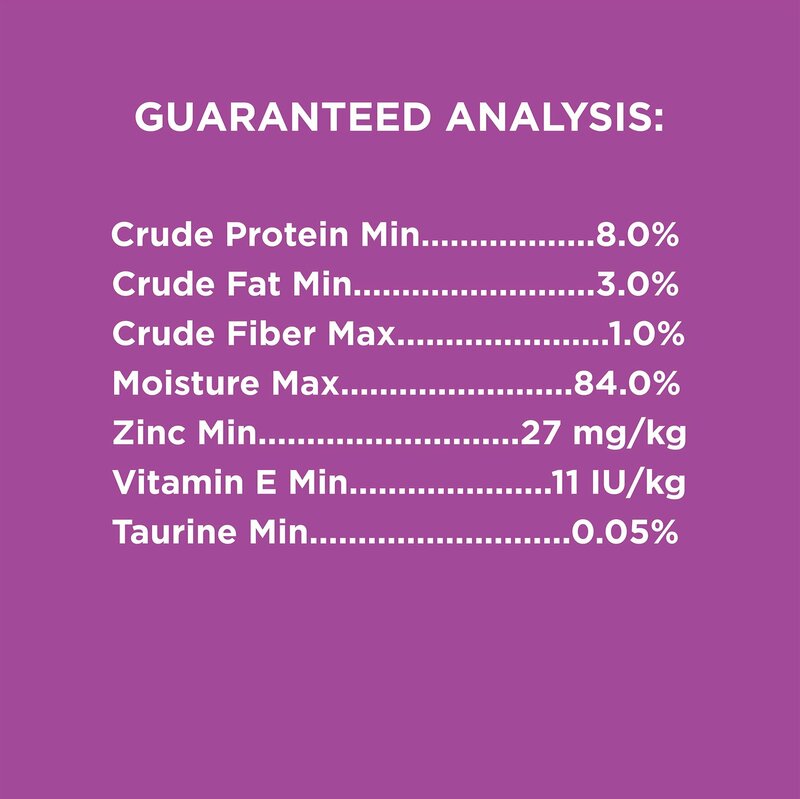 Plus it offers added moisture to your cat's diet, which helps keep her healthy and happy. Nothing wrong with the product, I have a finicky cat! I have older cats and they need a supplement to dry food to maintain their weight. I tried other canned food but it either made them sick to their stomachs or they developed skin allergies. They seem to be doing much better on the whiskas, I just wish they still made the pate', they do like that better. T-Lil says this is delicious ! I have one orange longhair cat, Tigerlily. 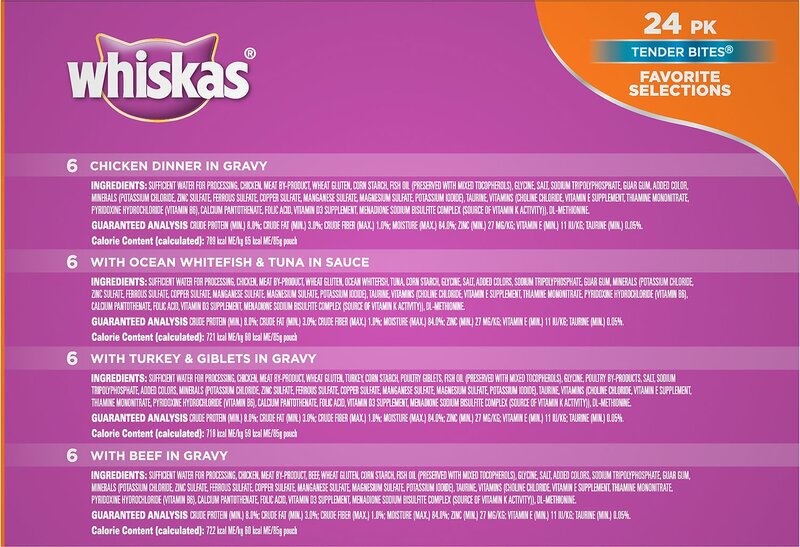 This Whiskas pouch has a good portion for every day. I can pinch the pouch,give her some more later or tomorrow. Never spoils like the canned food does. (Lots of treats in between!) YaY CHEWY ! From the time you open the pack and put it in the dish Your cat,or cat eat it all up before you can put the empty pouch in the waste bin The pouches are great ! Good price & the cat loves this product. Sometimes the local store runs out of this item because it is so popular. That’s ok though because I found Chewy & I don’t have to go to the store for pet supplies. My cat Sheldon (who I sadly had to have put to sleep due to complications from feline AIDS) LOVED Whiskas. He was the only cat I had that would eat it. He would eat the whole pouch and want more. Every time I look at the box or a pouch of it I think about my Shelly. My super-picky cat loves these; it's actually become the only wet food he'll consistently eat. We get two servings out of each pouch, and it's one of the few foods he'll eat after a day in the fridge. It's a winner! Love the price and the 24 pack! Love the price! Don’t have to shop as frequently or haul it home. My cars love it too. Our kitten loves this food! Our kitten loves this food! And the serving pouches are easy! We adopted her at 5 months old. We give her half a bag in the morning then fold the bag and keep in the refridgirator for evening. We serve her dry food in between. So glad that the Whiskas pouches are back and available. 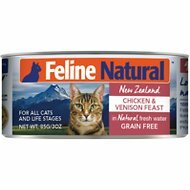 My 3 cats love it and no vomiting after eating..